If your workplace financial education focuses on saving for retirement, your message may not be resonating with a large part of your workforce: young workers. By reaching young, lower income workers, employers have the opportunity to support these employees and establish habits and lifestyles that can make a significant difference in the rest of their lives. Employers have an opportunity to positively influence the financial well-being of young workers. 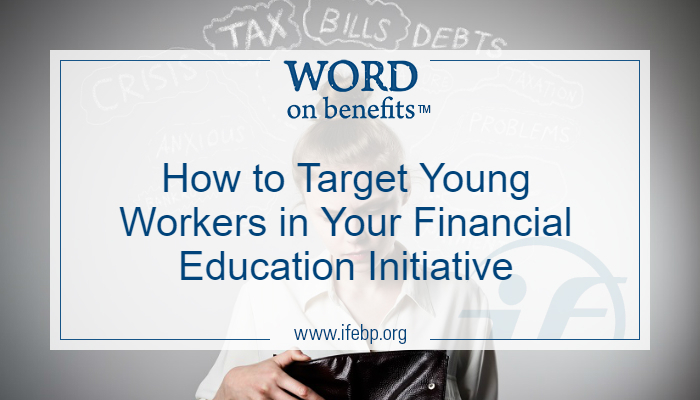 Although young workers aren’t the only group struggling to make ends meet, they are often forgotten in workplace financial education programs. 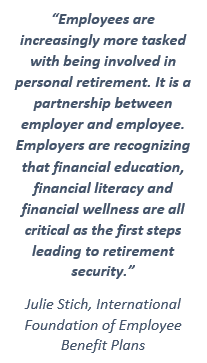 By offering financial wellness initiatives that include young workers, employers can build a more engaged and productive workforce benefiting both employees and employers. Young workers tend to worry about short-term financial issues, but services available at work primarily focus on long-term issues. The top worry for young workers is making ends meet—covering things like transportation, housing, food, utilities, health care and education. They also are concerned about paying existing debt (often school loans) and building an emergency savings fund. Workplace financial initiatives that focus on long-term goals, like saving for retirement, often don’t fit their current needs. Young workers want financial wellness services that are interactive, individualized, simple and secure. Services like financial coaching, financial classes, online tools and interactive savings programs are options that may be appeal to young workers. One-on-one conversations or employee surveys can help employers identify where their employees need support. Employers can leverage a number of existing programs, services and resources to meet the financial wellness needs of young workers. Young workers stress the importance of good wages and benefits to their financial lives and agree that financial wellness programs are important. Employers can provide services that subsidize or reduce typical expenses, like offering health insurance, rent assistance, dental and vision coverage, transportation assistance, phone bill reimbursement or discounts, and free or discounted child care. 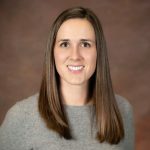 Employers can also connect their young employees to financial information and advice, help them save via retirement plans or other accounts, and help them understand how to best maximize income. Additionally, many nonprofit and government programs are designed for and target the specific needs of lower income workers, and many of these programs can be integrated into the workplace. There are also free informational resources from credible government channels that are readily available for download or mailed paper copies. Employers can and should track effectiveness and impact of services. While it may take some time before a program can demonstrate a return on investment, measurement and evaluation are still a necessity. Monitoring the program can also help reveal barriers to participation, like lack of awareness, inconvenience or confidentiality concerns. Looking for more resources on workplace financial wellness? Find them here.